This question has been asked of me several times today. I have heard everything from I don’t want my kids to be slobs to I don’t want them to expect me to wait on them hand and foot. Today FlyLady Liz played a game with her four year old son. She videoed him as he raced around his room putting things where they belong. I took the little videos and edited them with some cute music. He had a ball. Check it out! I have told you many times that I cannot preach what I don’t practice. This goes for you too. When you do your weekly home blessing our mop gets the job done! Our mop handle shrinks down to children-sized. It is a great way to get your children to help. We have everything you need to keep your home shining! The SuperDuper Summer Sale ends on Monday at midnight! 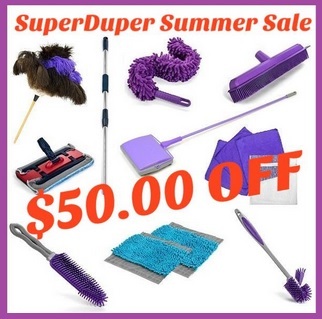 Our SuperDuper Summer Sale ends soon, the FlyLady Complete Cleaning System! Which is $50 off right now! Without having to use a Coupon Code. Have you ordered your 2019 Calendar yet.This calendar is a tool to help you get rid of the CHAOS in your life. The large squares give you plenty of room to write your family’s busy schedule. This entry was posted in Ask FlyLady and tagged ask flylady, Children, declutter, pick up, rooms. Bookmark the permalink.